So often when you think of a cuff bracelet you think thick and clunky, but I'm really loving the skinny cuff right now. It resembles a bangle but with the structure of a cuff. Simple and can work for some many styles depending on what you pair it with. Preppy with an oxford, boho with some buffalo plaid. 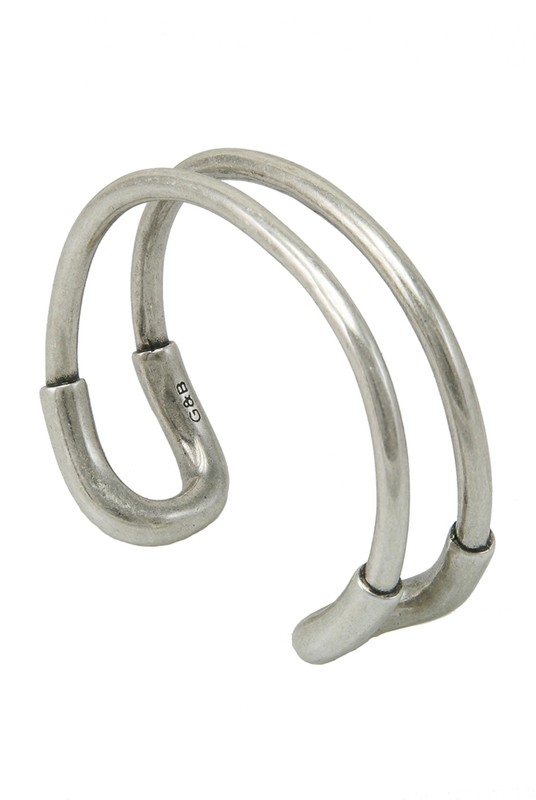 This industrial looking bracelet has a great rocker edge to it. A little hobo chic, no? But add it to your gold watch and you can dress it up. I love this Aztec inspired engraving on this piece, something rugged about it. I'm obsessed with this bracelet. It is so unexpected for someone who usually dresses very girly. This cuff to me says, bring it on. So if you've avoided cuffs because they're too thick, too much of a statement on your arm; check out these options and layer a couple on to add some bling to your outfit. super cute! I love dainty arm candy too! I really like the intricate engraving on the Free People bracelet! I'd always rather wear a few thin bracelets than one big one. This is such a good point! I've been noticing the skinny cuffs more, too...and I am definitely on board with the arm parties that have been going on, the more the merrier! Have a great weekend, lady! I am always afraid to wear a big cuff because of my super skinny wrists, but a couple of little ones might do the trick. Great post.